Walter Edward Hunt was the youngest child of Charles Moses Hunt (known as Moses) and Elizabeth née Woodward. He was born in the parish of Eastington on 19 January 1878; the family's home was on Bristol Road, close to its junction with Perryway. By 1891 Moses, an agricultural labourer, Elizabeth and Walter had moved to The Street, near to Frampton Vicarage. Walter, like many young men of his generation, left the village to seek work, and spent a short while at Western Colliery, Pontypridd, before moving to Norton Canon, near Weobley, Herefordshire as a labourer. On 29 July 1895 Walter enlisted in the Militia, claiming to be a year older than he was, but with a physique to back it up. He was posted to the 4th Battalion of the King's Shropshire Light Infantry. However, the periodic training and two-week annual camps were not enough for him, and on 27 May 1899 he joined the 'Special Service Section' of the Militia, which rendered him liable for overseas service with the Regular Army. He did not then have long to wait: with the outbreak of the Boer War on 11 October that year, he was embodied into the 2nd Battalion and embarked for South Africa. Arriving after the ignominious defeats of Magersfontein and Colenso, he might well have had a first experience of the barbed wire, machine guns and trenches (that we associate primarily with the First World War) during the offensive which led to the relief of Ladysmith. Walter came home on 31 May 1902 and was discharged in July 1902 at the end of his engagement. When Walter married his cousin, Annie Maria Hunt, at St Michael's, Gloucester, on 18 April 1903, he was a waterman. 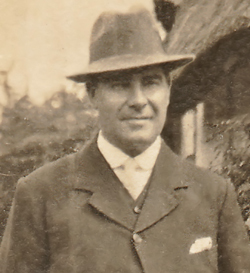 Their son, William Charles Edward, was born on 13 May the same year and when he was baptised at St Mary's on 22 May 1904 the Revd Ward, somewhat mistakenly, suggested in the register that his parents were unmarried. He also gave Walter's occupation as a private in the Gloucestershire Regiment. The Hunt's home by 1911 was one of the cottages, since demolished, between The Villa and Wild Goose Cottage on The Street; at the time of the census, Moses was living with them, and Walter was an able seaman on board the trow, Industry, near Chepstow. With the outbreak of the First World War, Walter re-enlisted. Serving with the 1st Battalion of the Gloucestershire Regiment he was soon back in action, landing in France on 28 November 1914. Arriving during the First Battle of Ypres, he would have served with his unit throughout the Neuve Chapelle, Second Ypres, Artois and Loos campaigns. We know that he was transferred at some point to the 2/5th Battalion, which was deployed to the Front in May 1916; he might have joined them as an experienced soldier to help show the new men the ropes, or it might have been after he suffered a wound, as reported in the Gloucester Journal of 28 April 1917. He is likely to have been with them on the Somme, at Cambrai, on the Lys and in the heavy fighting of the final Allied 'Hundred Days' offensive. Walter was later awarded the 1914-15 Star, British War Medal and Victory Medal and his service is commemorated on the plaque in the village hall. After the war Walter and Annie remained in The Street for a while before moving first to The Glen (a bungalow on Perryway), and then to Alexandra Cottage, Bridge Road. He worked at Cadbury's and was a popular Father Christmas at their annual children's party for many years. Walter Edward Hunt died suddenly at home on 5 October 1955 and was buried in St Mary's churchyard three days later.